Stories play an intrinsic part of our lives, society, and culture. We all make and tell stories to connect to others, share our emotions and express ourselves. Storytelling fosters positive role in a child’s physical and cognitive development from the small age. Children use simple media like pen/paper or wooden blocks to sophisticated online software like Scratch or electronic toys like Lego Mindstorms to imagine and create stories. Stic Stac (pronounced as Stick Stack) is a new way of making stories. It is a storymaking tool that allows children in age group 9-14 years to create unique stories using tangible blocks and augmented reality. 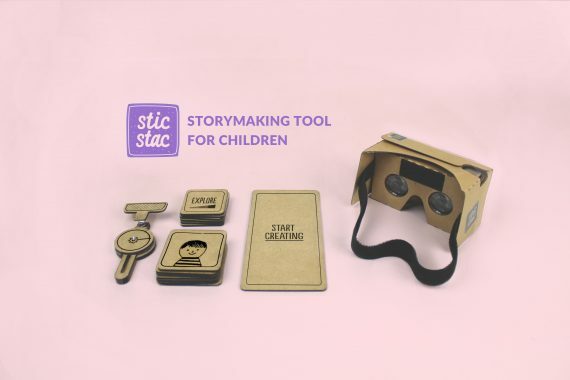 Stic Stac allows children to go creative with the virtual content. SticStac kit has a mobile app, a Canvas, a Controller and two types of blocks – Object blocks and Activity blocks. Object blocks show virtual content like characters, animals, trees or other non-living things which you could put in the scene. Every Object block has properties like size, colour, quantity, type, clothes of a character etc. which could be manipulated (using the Controller) as per child’s desire. The content is then placed anywhere on the blank canvas. And hereafter, it results in an open-ended play or stories when the Activity Blocks(semi-automatic AI) are plugged to the characters. This is the most interesting part. The starting position of the characters on the canvas determines the character interactions and how the story unfolds. The AI is semi-automatic as it gives the child to control the interactions and thus the story. For instance, using the PLAY activity block and the Controller, the child could decide how much his/her character is Playful. This is equivalent to a writer/storyteller giving a degree of personality or mood to the character in the context of the story. More complex stories could be built by using SaveScene block. Thus, fostering a playground for kids, to explore, experiment and build interesting artifacts. All the stories are automatically saved to the Stic Stac mobile app which could be then shared with others. The present work is the first working version and going ahead, I envision several new possibilities in Stic Stac. For example, a Stic Stac library which allows children to access new virtual content on the same block or the ability to upload custom designed content for others to use. They could also download pre-built stories and then build more complex stories on the top of it. There could be several themes like space, underwater, dance, music etc. The possibilities are many.